How to make your scrambled eggs even better. In this week’s video from Panna, F&W BNC Daniel Patterson revealed the easy way to make creamy, fluffy scrambled eggs by poaching them. It’s a terrific trick that produces great results with barely any mess. Here, more ways to make your scrambled eggs even better. Wrap them in a tortilla. Roll scrambled eggs, sautéed Swiss chard and tomatoes into terrific, vegetarian breakfast tacos, which are equally good for lunch or dinner. Top with croutons. Instead of serving scrambled eggs with toast, top them with herbed croutons for a fun take on a breakfast staple. Shave on some bottarga. Salted, pressed and dried mullet roe (a.k.a. bottarga) has a deep-sea umami flavor. It adds terrific complexity to herb-flecked scrambled eggs on toast. Serve them with potato chips. No one said upgrading has to mean spending more money. 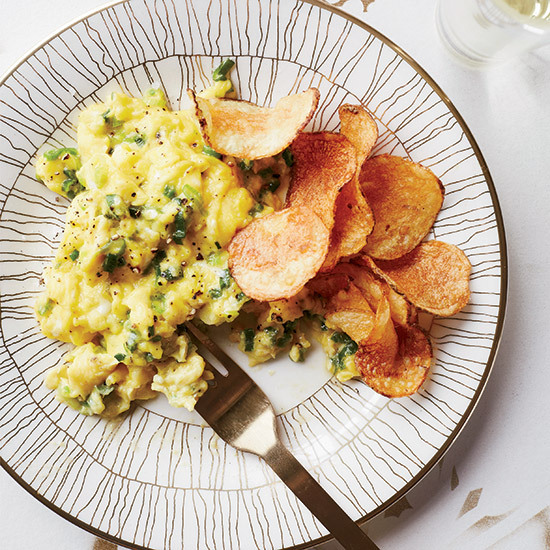 Simply serving scrambled eggs with crispy kettle-cooked potato chips is a fast and fun way to make the dish even better. Stir in sparkling wine. Scrambling eggs with some dry sparkling wine like cava gives the dish a terrifically light texture. Put them on pizza. Make an over-the-top breakfast pizza by topping pizza dough with crisp bacon, custardy scrambled eggs and two cheeses—Brie and mozzarella. Garnish with truffles. Scrambled eggs and thinly shaved truffles are a no-brainer of a pairing. It’s the perfect easy-to-prepare but totally decadent dinner.